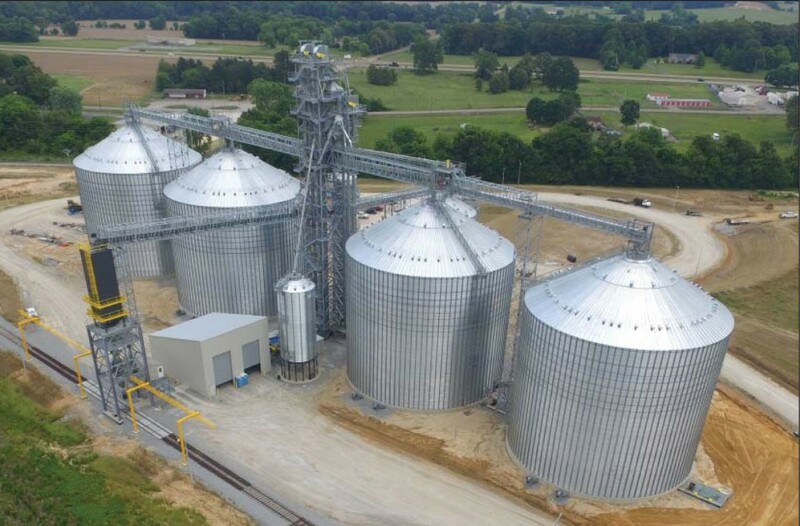 The Andersons’ Inc.’s new 2.9-million-bushel rail terminal nearly complete north of Humboldt, TN. Aerial drone photo courtesy of ASM Engineering Consultants, LLC. In the last decade, grain production has increased gradually across the MidSouth, as cotton acres have been on the decline. In 2012, The Andersons Inc. acquired a group of five grain elevators located across western Tennessee. A combination of larger, more efficient harvesting equipment and increasing production made it hard for The Andersons’ Trenton, TN facility (731-855-3971) to keep pace. The 2.5-million-bushel Trenton facility is landlocked in town sandwiched between the town and wetlands with minimal space for growth. The facility also needed a number of upgrades. The new facility at Humboldt, TN (731-784-3212) is located seven miles south of Trenton and four miles north of Humboldt. The Trenton facility will remain in operation and work in conjucntion with the new 2.9-million-bushel steel rail terminal at Humboldt, which went into operation in June 2016. Vanasdale comments that the new location was ideal for an elevator, with quick access to the four-lane U.S. Highway 45W. This location also is served by the West Tennessee Railroad (WTNN), the same short-line that serves the Trenton facility. Brock tower dryer is fired by natural gas and rated at 4,700 bph at five points of moisture removal. The Andersons loads unit trains on the WTNN, with connections to the CSX, Norfolk Southern, Kansas City Southern, and Canadian National Class I railroads. To construct the facility, The Andersons hired Custom Agri Builders, LLC, Washington, IN (812-257-1115), as general contractor and millwright on the project. The contractor’s sister operation, Custom Agri Systems Inc., Napoleon, OH (419-599-5180), provided electrical and automation systems on the project. Both divisions are veterans of a variety of projects for The Andersons in Indiana, Michigan, and Ohio. Site work was performed by Delta Contracting Co., LLC, Humboldt (731-784-3053). In addition, ASM Engineering & Consultants LLC, Andover, KS (316260-5895), performed engineering work on the project. Construction on the elevator began in August 2015. The project was budgeted at $20 million, but the final figure will not be known before September. CompuWeigh bulk weigh loadout scale. Ground level photos by Ed Zdrojewski. The terminal consists of seven Brock corrugated steel tanks – four large 690,000-bushel long-term tanks, a 100,000-bushel wet tank, and two 20,000-bushel hopper tanks, one for screenings and one for general blending. Vanasdale notes that the big tanks had to be designed for seismic events due to western Tennessee’s proximity to the potentially volatile New Madrid fault directly across the Mississippi River. “We were limited to 32 rings tall, although we would have preferred to go up 35 rings,” he says. As it is, the four big tanks are plenty large enough standing 105 feet in diameter, 86-1/2 feet tall at the eaves, and 114 feet tall the the peaks. They have flat concrete floors, outside stiffeners, 10-foot-x-10-foot Bobcat doors to admit skid steer loaders for unloading, and 24-cable OPI-Integris digital temperature monitoring systems. A set of four Brock 50-hp centrifugal fans provide aeration through in-floor ducting in a quad-F pattern. The wet tank stands 48 feet in diameter and 64 feet tall at the eaves. It is outfitted with outside stiffeners, an OPI-Integris digital grain temperature monitoring system, a Daay bin paddle sweep, and a pair of Brock 15-hp centrifugal fans providing aeration. Incoming grain arriving by truck is routed onto a single Rice Lake 70-foot inbound/outbound pitless scale adjacent to a single-story office building containing a grain laboratory. An InterSystems probe adjacent to the scale samples trucks. From there, trucks are routed to one of two enclosed 900-bushel mechanical pits. A third pit handles trucks or railcars. The pits feed a pair of InterSystems 20,000-bph legs equipped with 20×8 Tapco CC-HD buckets mounted on 22-inch belts. The legs empty into six-duct Hayes & Stolz rotary distributors, which in turn, send grain via 20,000-bph overhead InterSystems drag conveyors out to storage. The big tanks empty onto a series of Hi Roller enclosed belt conveyors in below-ground tunnels. These run back to the receiving legs. The wet tanks empty into an InterSystems reclaim drag conveyor that feeds multiple InterSystems legs to take the grain to the desired location. The wet bins also can feed a 4,700-bph, natural gas-fired Brock tower dryer. The dryer, in turn, empties into an InterSystems reclaim drag conveyor and feeds into an InterSystems dry leg. Other than some test firings, the dryer has not yet seen use. The two receiving legs and the dry leg also can be used simultaneously to send grain out to rail loadout via an overhead Hi Roller enclosed belt conveyor. 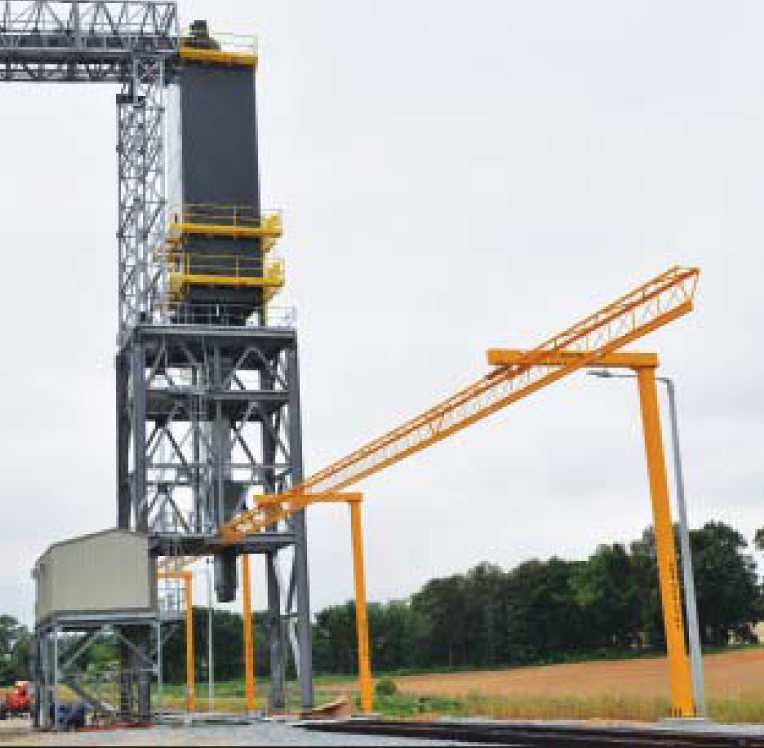 Railcars are loaded with a bulk weigh loadout scale and automation system. Workers atop railcars during train loading operations attach harnesses to a Fall Protection Systems trolley unit running the length of three to four railcars.